We play a key role in supporting endowed chairs that attract world-renowned researchers and scholars at UB—including John M. Canty Jr., MD, SUNY Distinguished Professor, Albert and Elizabeth Rekate Professor and chief, Division of Cardiovascular Medicine. John Canty Jr., MD, is the Albert and Elizabeth Rekate Professor; the Rekate chair is one of the oldest endowed chairs in UB’s Jacobs School of Medicine and Biomedical Sciences. At UB, Canty is responsible for the clinical, teaching and research programs related to adult patients with heart disease. 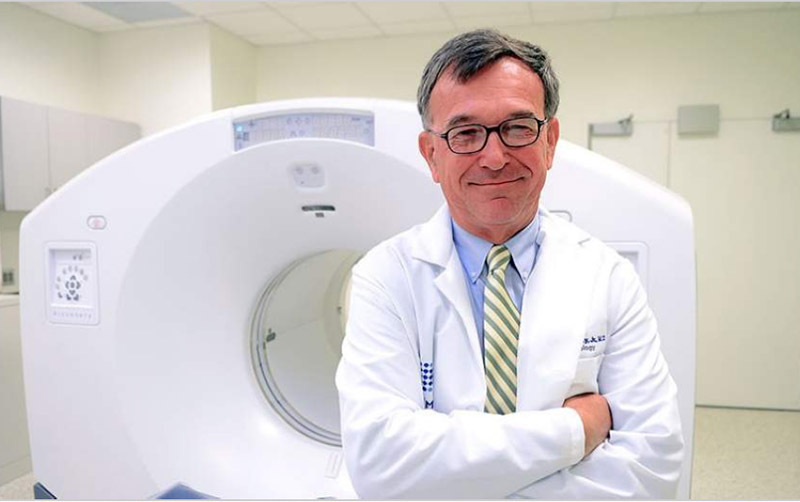 In addition to his research, he serves as deputy director of the UB Clinical and Translational Research Center (CTRC) and director of the university’s Translational Imaging Center. Canty received his MD from UB more than 30 years ago, and—except for his internship and residency—has been with the university ever since. At the UB Foundation, we are proud to play a significant role in recruiting and retaining renowned faculty, by enabling donors to direct funds to a specific purpose such as an endowed chair. Canty recently answered some questions about his work at UB; here’s what he had to say. What opportunities have kept you here at UB for more than 30 years? Canty: I have gone to work each day thinking that I have the greatest job in the world. I’ve also been privileged to spend my entire career at the same institution. It’s provided stability and allowed me to develop a solid research program and a strong division of cardiovascular medicine by helping attract new faculty to UB. There have continually been great opportunities to collaborate with talented faculty in disciplines as diverse as proteomics and engineering. These collaborations help us develop new areas of interdisciplinary research that keep you learning new things and thinking outside of the box. As an added bonus, I am privileged to be occupying my fourth new research laboratory and office since joining UB. It seems that UB has built a new research building about every 10 years or so. Most faculty have to move to another institution to get new space and equipment. 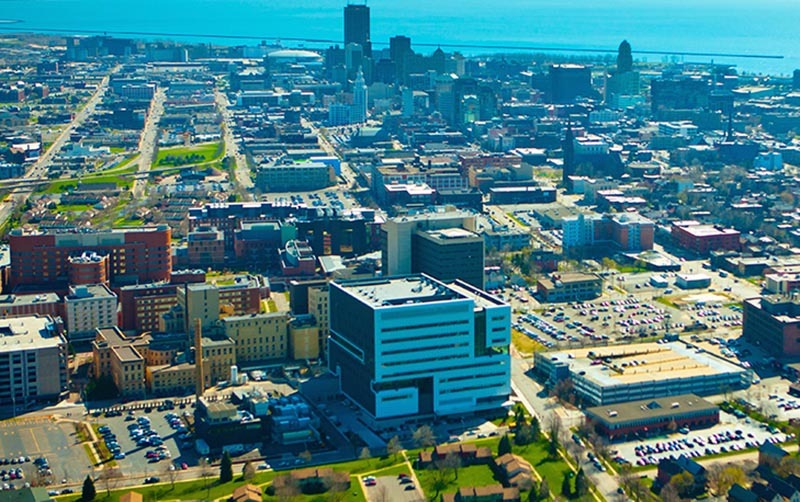 Why is UB a good fit for the teaching and work you are doing? Canty: The institution and environment are very supportive at all levels, and all of the resources that I need are here. Right now, our group resides in one of the best facilities in the world for doing translational biomedical research. The new CTRC sits atop a heart and vascular hospital that is a state-of-the-art facility for cardiovascular care, and the top floors are a one-of-a-kind facility for pursuing both basic and patient-oriented research in cardiovascular disease, which happens to be the leading cause of death in Western New York. This makes an ideal circumstance for physician-scientists to teach, pursue research and provide high-quality patient care in the same setting. Moving the new medical school to the downtown Buffalo Niagara Medical campus is an added bonus that, quite frankly, was something that I would not have predicted would occur during my career. The move of the medical school brings great excitement to our program and all of our faculty. As the Albert and Elizabeth Rekate Chair in Cardiovascular Disease, what impact has philanthropy had on your career? Canty: Early on, Rekate recognized the need to support the educational and research mission of the Division of Cardiovascular Medicine in the Jacobs School of Medicine and Biomedical Sciences. The chair he endowed provides funding to support the fundamental academic mission of the faculty in terms of education and research. Flexible funds from endowments such as this allow you to develop new programs and different research directions in a fashion not possible with current extramural grant funding. This type of flexibility is particularly important to provide the key preliminary data you need to show that new research directions are feasible and worthy of support from sources like the National Institutes of Health. Why is private support so important to the continued success of UB and the Jacobs School of Medicine? Canty: We at UB pursue the mission of a public research university, yet our ability to do this solely through funding at the state level is not the same as it was 50 years ago. With state funding representing a declining portion of institutional support, private funding has become increasingly important. Besides supporting new initiatives, it is particularly important to attract new faculty to begin their careers at UB by providing sources of flexible funding for start-up funds. In addition, developing endowed chairs helps the university compete to attract internationally renowned faculty from other institutions. What would you say to the donors who made it possible for you to remain at UB? Canty: I would simply express thanks and gratitude for having the generosity and foresight to provide critical support to one of the many successful research groups we have at UB. The Albert and Elizabeth Rekate Professor of Medicine is one of the oldest endowed chairs in UB's Jacobs School of Medicine and Biomedical Sciences. It honors Albert C. Rekate, MD ’40, who established the UB Department of Rehabilitation Medicine and played a role in the creation of the UB School of Public Health and Health Professions. Willard Boardman, MD ’44, a close friend who was a student of Rekate’s, established an endowment to support the chair. Rekate, a cardiologist and UB professor until 1986, and his wife, Elizabeth Foster Rekate (who predeceased him in 1985), gave generously to UB to establish chairs in cardiovascular diseases and rehabilitation medicine in the medical school. A recipient of UB’s Samuel P. Capen Award and the medical school’s Dean’s Award, Rekate died in 2010. Our investments–including the endowment that we manage for the betterment of UB–have grown consistently through the years. This growth helps ensure a predictable revenue stream that supports scholarships, endowed chairs and faculty research. The Gift Stewardship Committee helps attract the private support that is crucial in recruiting top faculty and providing world-class facilities.